Until now, there has not been a world-class method of measuring human potential. Much like the geocentric model of our universe, the measurement of human potential has been too easily skewed by our cognitive biases and our inability to effectively measure beyond what we see. As scientists, we wanted to discover a better way. Scientific method has accelerated understanding in a range of fields. Astronomy has progressed from a primitive observation of celestial alignment to our highly sophisticated and ever-improving understanding of the chemistry and physics of our universe. In the same way, the new frontier in measuring human potential is the application of scientific method to measurement design, processes and systems. How far can science take us? When we look at the night sky, we see a picture of the past – light that is at least four years old (and in the right conditions, even up to 1,500 years old). Traditional approaches to measurement operate in a similar way, only looking back at past outcomes and impacts. We need to be more scientific in the measurement of human potential. This firstly means that return on investment and long-term impacts are clearly proven. More importantly, it means that effective initiatives are prioritised, and then better designed measured and monitored. In turn, this leads to further return on investment and even greater impact. We call this ‘evidence for impact’, and it is a central tenet of scientific approaches to measuring human potential. Where evidence of impact shows what worked, evidence for impact uses this information to dial up what works, and dial down what does not, enabling future positive impact. The additional features that differentiate scientific approaches from traditional ones are outlined below. The application of scientific principles to the measurement of human potential may sound like a theoretical endeavour. In fact, it is quite the opposite. 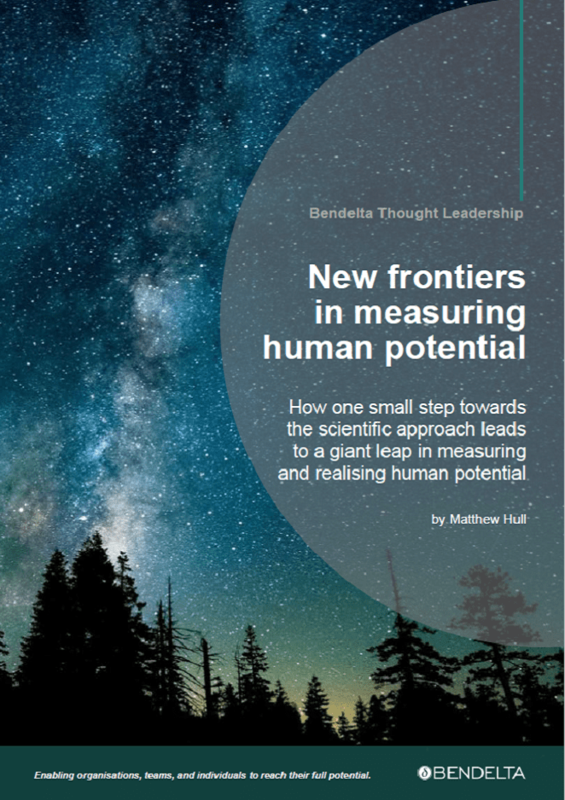 In our experience, there are four key elements that enable a practical and adaptable scientific approach to measuring human potential in the context of organisations and their people. Traditional approaches to measurement have tended to be individual and reaction focused – measuring engagement rather than transformation, and short-term over long-term outcomes. Adopting a mindset of evidence for impact entails thinking about individual and organisational development as an exploratory ‘quest’ rather than a fixed ‘target’. This means that, in addition to evidence of impact, we can shape the design of initiatives and the organisational system to better support and enable the understanding and realisation of potential over time. As we learn more about what works and why, this is where we focus our attention and investment. 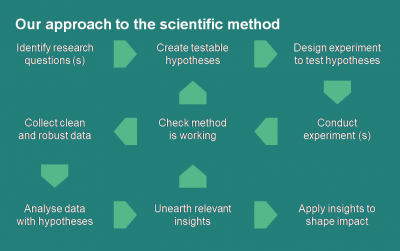 Scientific method is a structured and systematic process for designing and conducting robust experiments. The goal is to collect and analyse data that answers research questions and tests pre-determined hypotheses. As outlined in the image below, our approach begins with determining the key research questions and developing a measurement plan against these. We then outline hypotheses to be tested, related methods, data sources and analyses to be conducted. At each stage, we work through a series of checks to ensure integrity of the methodology and data. Picture yourself looking at the stars through a hand-held telescope, and then suddenly upgrading to the Hubble Space Telescope. The quantitative and qualitative analysis tools that we have ready access to today were once exclusive to academics and scientists. With this in mind, the days of descriptive analysis using basic technologies is far behind us. At the same time, the ability to conduct complex analyses of text and metrics does not mean we need to analyse everything in every possible way. The measurement plan, based on scientific method, should guide analysis methods. 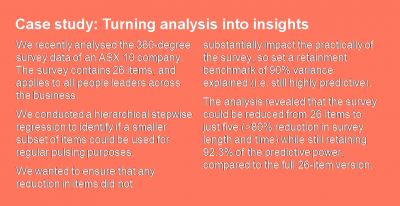 One of the common mistakes when interpreting analysis is that insights are developed without a thorough appreciation of the individual/organisational context within which they sit. This tends to mean that they are irrelevant and difficult to action. Our team of psychologists, psychometricians, behavioural scientists and organisational architects are experts in the objective interpretation of measurement results. More importantly, however, our approach involves the co-design of insights in the organisational context to ensure relevance. New frontiers in measuring human potential are being accelerated by the application of scientific approaches. As we step away from traditional approaches and towards a more world-class approach, there are opportunities for monumental leaps in the realisation of human potential.